Washington, D.C. (April 11, 2019)—On Wednesday, Sen. Bernie Sanders introduced new Medicare for All legislation that would largely eliminate private health insurance. 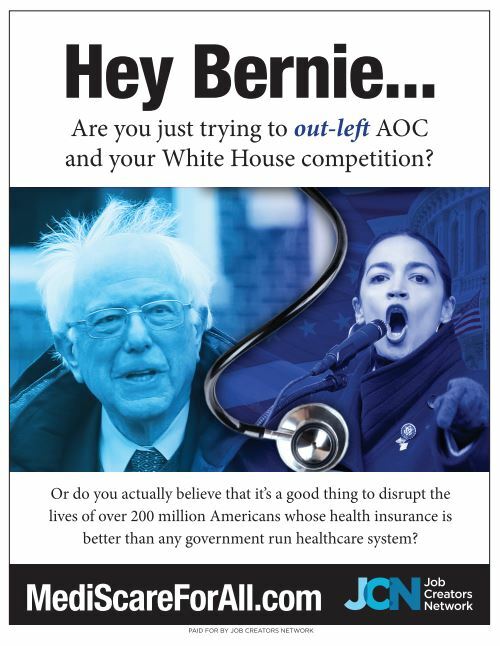 In response, the Job Creators Network (JCN) is ran a full-page advertisement in The Hill on Thursday highlighting the consequences of a government run health care system, as well as poking fun at Sen. Sanders for attempting to move to the left of Rep. Alexandria Ocasio-Cortez in order to pad his run for the White House. In addition to the ad, JCN has also distributed a letter to members of Congress urging them to publicly reject the Medicare for All proposal because it will deeply harm small businesses. Read a copy of the letter here.